You are here: Home / Appetizers / Gluten Free Cracker Recipe That Will Amaze You! Gluten Free Cracker Recipe That Will Amaze You! This gluten-free cracker recipe is unbelievably easy! You will be amazed that a few simple ingredients of quinoa, water, and spices can turn into a delicious cracker! These crackers are vegan, gluten free, soy free, and whole grain clean eating! How do you make easy gluten-free crackers? These crackers are made from whole grain quinoa, not processed flour! You simply soak the quinoa grain and then blend it into a batter! I learned that you can use quinoa in this way from the blog Simply Quinoa. Her quinoa pizza crust recipe is delicious and made using a similar process. I decided to play around and see if I could make cracker this way too, and… it worked! It’s hands down the easiest way I have ever found to make homemade crackers. How can you turn whole grain quinoa into crackers? Most homemade cracker recipes require you to make a dough, roll it out, and carefully cut out and transfer the crackers to a cookie sheet for baking. 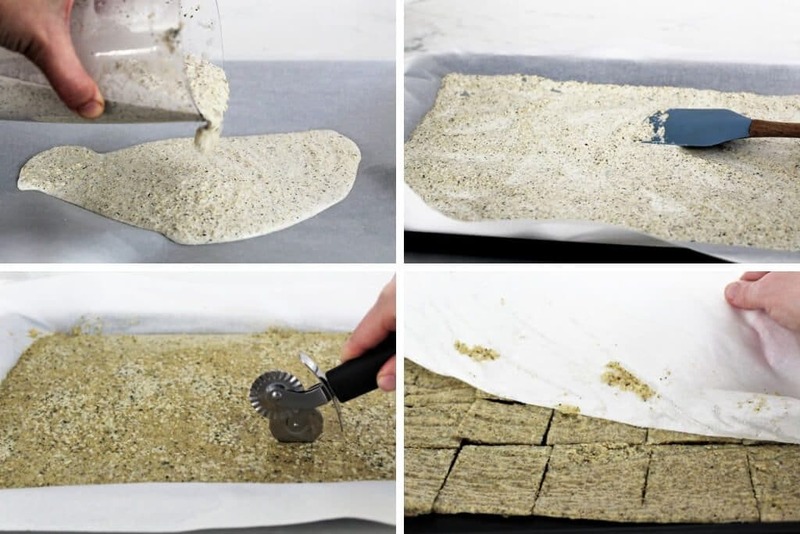 This method of making crackers doesn’t require any of that hard work! Start by soaking the quinoa grain in water for a few hours or overnight in the fridge. Then drain and rinse the grain and add a little water, spices, and salt. Using an immersion blender or regular blender, blend on high for a few minutes until the grain turns into a pancake-like batter. Poor the batter onto a parchment lined cookie sheet. (Sprinkle with some hemp or sesame seeds and kosher salt if desired). Bake the crackers for about 15 minutes before taking out of the oven and cutting into squares. Then flip the crackers and peel off the parchment paper. It’s that easy! With very little effort on your part, you have healthy whole grain quinoa crackers that you can use for guilt-free snacking! The hardest part is remembering to soak your quinoa. 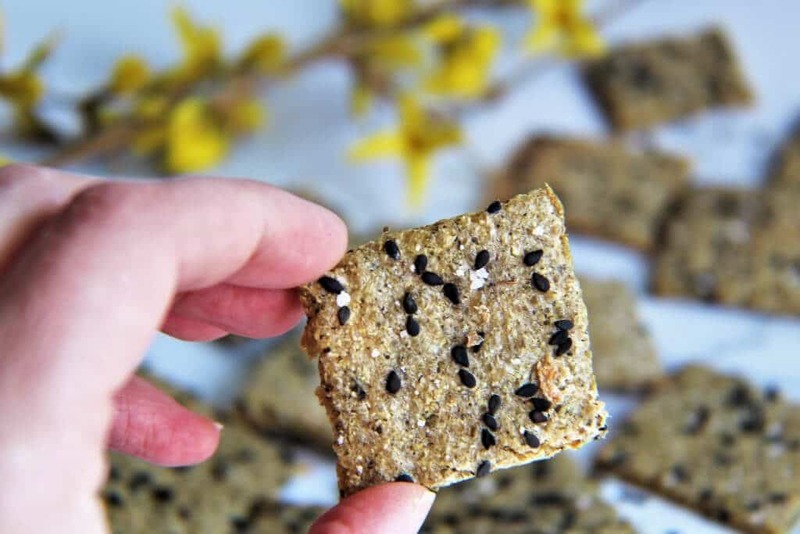 This gluten-free cracker recipe is one that you will want to make over and over again! 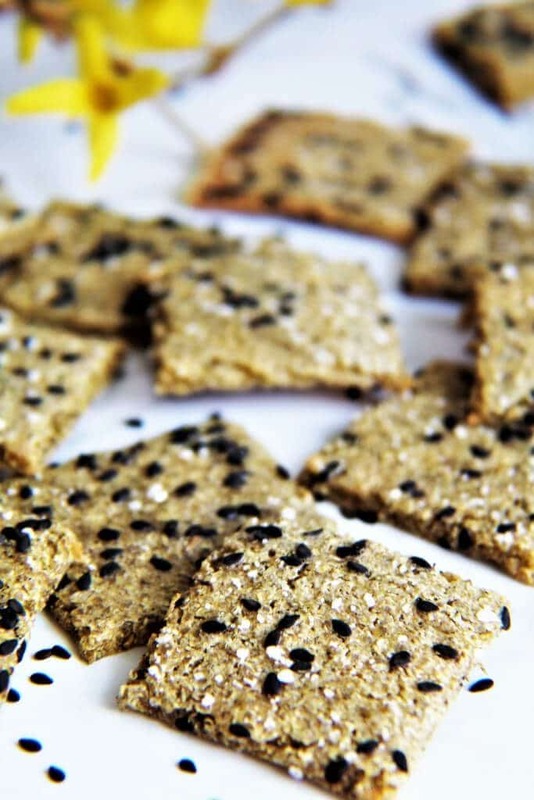 What foods go well with this gluten-free cracker recipe? Serve these crackers with your favorite vegan cheese like this homemade vegan cheese with garlic and herbs! Did you make these crackers? Leave a rating and comment below! We would love to hear from you! 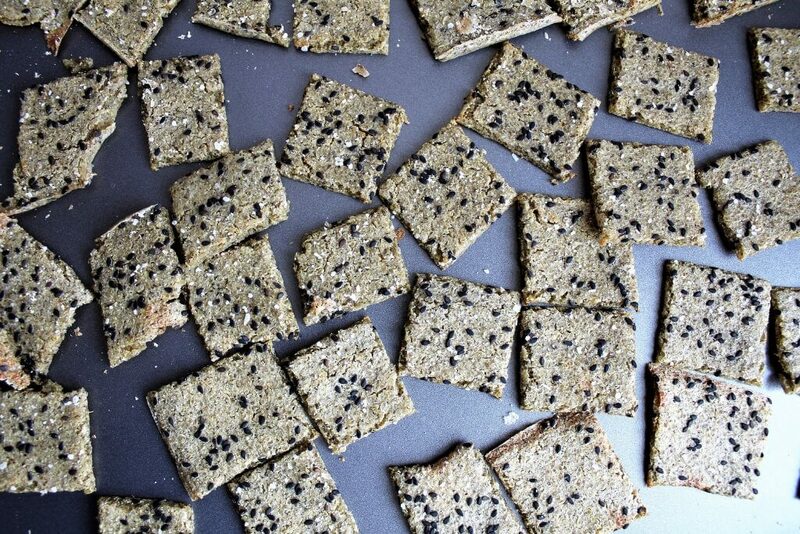 An easy recipe using whole grain quinoa to make gluten-free and vegan crackers. Pre-heat the oven to 375° F.
Soak 1 cup of whole grain quinoa in about 2 cups of water until it doubles in volume. (I soak it right in my immersion blender container). Soak for at least 6 hours with cold water or 1 hour in very hot water. 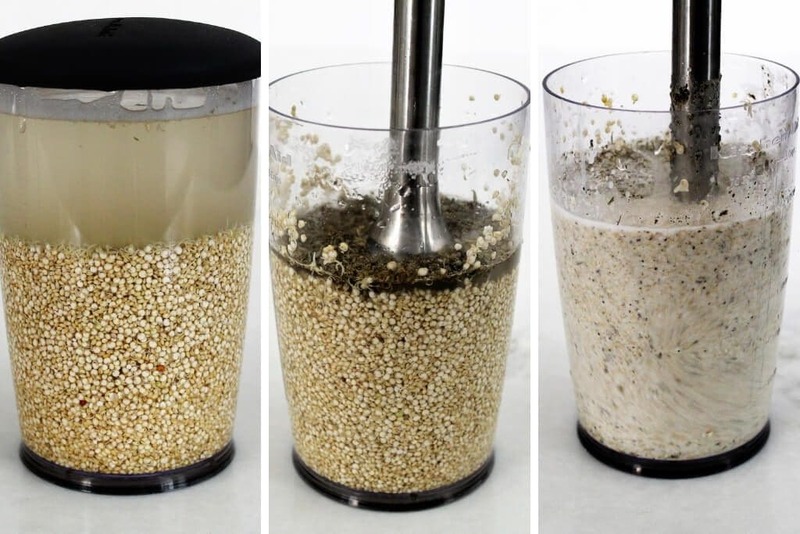 Drain and rinse the expanded quinoa and put into a blender or immersion blender container. Add 1/3 cup of water, salt, and 2 tsp herbs of choice. Blend for about 3-4 minutes until it becomes like a slightly chunky pancake batter consistency. (It will seem like it may never turn into a batter at first, but keep mixing)! (If you did not soak the grain long enough you may need to add another tablespoon of water to get it to blend into a batter, but only do this after you have blended for a few minutes and you are sure that it needs to be thinned out). Line a large cookie sheet with parchment paper and pour the batter on the parchment paper. Use a spatula to spread it out evenly and give it a shake to get the batter very thin and even on the cookie sheet. (Sprinkle with seeds and/ or kosher salt if desired). Bake for 15 minutes then take out of the oven and cut into squares with a pastry or pizza cutter. Flip the crackers over and peel off the parchment paper and bake for another 15 minutes. Make sure all the crackers are in separate pieces and flip again seed side up and bake about another 10-15 minutes until dry and crisp. (The ones on the outside of the cookie sheet or those that are thinner will cook faster. Remove any that start to get golden brown and leave the others until they have all cooked evenly). Let cool completely before storing in an air tight container. White quinoa tastes best in this recipe, however, you can use red or a mix. The amount of water needed with vary slightly depending on how long the quinoa has soaked. Quinoa is ready to blend after it has doubled in size. Shorten soaking time by soaking in very hot water. These crackers are delicious hot out of the oven, but they store well in an airtight container too. My first batch of these crackers came out of the oven half an hour ago and they are already gone! Fab recipe. I will definitely make it again and again. I don’t have any parchment paper on hand… Can I use tin foil instead? Hi thanks for the recipe. Just one question before I try this. Can I use the prewashed quinoa ? Will the soaking time be the same? Hi Rozina- Yes, you can use the pre-washed. As long as you are starting from dry the soaking time will be the same. I love this recipe! I can’t believe how easy it was to make my own crackers! Thanks so much for sharing this ! Thanks Kim! I never thought that I would be making my own cracker, but this method makes it so easy!